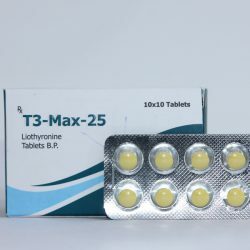 Liothyronine Sodium Is a synthetic form of thyroid hormone (T3) used to treat hypothyroidism and myxedema coma. It is also used as an augmentation strategy in treating Major Depressive Disorder when used in combination with antidepressants. It is marketed as the sodium salt under the brand name Cytomel (or Tertroxin in Australia). T3 comes under the class of drug called anabolic steroids. It is a prescribed drug. Liothyronine Sodium is offered on sale online under different brand names which are helping the body’s muscle cells produce more protein which, as long as the athletes works out, leads to increased muscle size and strength and, at the same time, also allows the body to produce more ATP, the “fuel” muscles need to move. Cytomel is the commonly associated brand name for the synthetic thyroid hormone Liothyronine Sodium. This is a perfect replica of the naturally produced thyroid hormone triiodothyronine, or what is commonly referred to as the T3 hormone. While synthetic Cytomel has been available since the 1950’s, thyroid hormones including T3 have been used medicinally since the 1890’s. 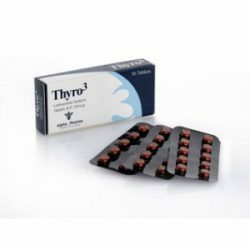 Early thyroid treatment plans were simply pure animal extracts and contained pure forms of the T3 and T4 hormone. Extracted thyroid hormones proved very useful in therapeutic treatment plans, specifically in the treatment of hypothyroidism. This is a condition in which the thyroid simply no longer produces enough thyroid hormones, which can lead to weight gain, loss of energy, hair loss and changes in the appearance and texture of the skin. With the introduction of Cytomel, the synthetic model of the T3 hormone, this has provided a much safer and sanitary hormone for such treatments. Cytomel is not the only synthetic thyroid hormone available. The T4 hormone, Levothyroxine Sodium is also available found under the trade name Synthroid most commonly. Both T3 and T4 are very similar in nature; however, T3 is considered 4-5 times more powerful than T4. T4, in simple terms, acts as a reserve for T3, which makes the Cytomel version the more powerful of the two popular thyroid hormones. While both are effective in treating hypothyroidism, Cytomel is the preferred thyroid hormone among performance enhancement athletes. Anabolic steroid users commonly use Cytomel in an effort to lose body fat. 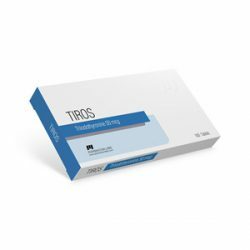 Buy T3 in the following options: just choose what form (oral or injectable) you would like to use. Liothyronine Sodium is available in various packages on our site. You can find (do not anything here) online for sale. Our first time customers prefer T3 Cytomel but more experienced steroid users would like to get this drug to use in cycles or stack Liothyronine Sodium only in their workout programs. If you want US to US delivery in 2-4 Days you can also buy T3 Cytomel at just with fast international delivery within 3-6 days. What are the main advantages of using T3 in bodybuilding? In simple terms, when you use synthetic T3, you are increasing your overall thyroid hormone levels, which causes metabolism to speed up. Unfortunately, when you do this, your body will stop producing T3 naturally until you cease usage of Cytomel and the body recovers. A similar situation occurs when bodybuilders inject testosterone that suppresses natural production of testosterone in their bodies. Our advice: buy Liothyronine Sodium online from any reputable and legal online medical store no prescription. You can get advice and information from online general practitioners and order Liothyronine Sodium injections and pills without prescription from the our website. One can buy T3 online from any registered and legal website. When used for treatment of hypothyroidism, the dosage will be determined on an individual level by the attending doctor. On the other hand, bodybuilders have several ways to run this compound, ranging from a very conservative method, to an aggressive method focusing on rapid weight loss. Cycle length is also a factor. The conservative approach is 12.5-25 micrograms (mcg) per day (either single in the morning or split dose) for 4-6 weeks. This dosage will cause minimal thyroid suppression, as well as minimal side effects while on. The more aggressive approach is 50-75mcg per day (usually split dose AM/PM) for 2-3 months. This approach may potentially cause side effects and suppress natural thyroid production. Therefore, post use supplement therapy is very important to help the body rebound quicker. It is recommended to run T3 with anabolic steroids in order to avoid loss of muscle mass. How to order Liothyronine Sodium online? Our steroid shop offers secure and reliable shopping of Liothyronine Sodium. Once you choose any of T3 products you just add it to your shopping cart. We sell only proven top steroid brands so you should be confident in quality of Liothyronine Sodium that you buy from us. 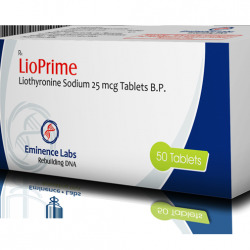 Any person can order Liothyronine Sodium from this website: this means that we are happy to deliver your order to any address in USA, UK, Canada, Australia, Europe or Africa. 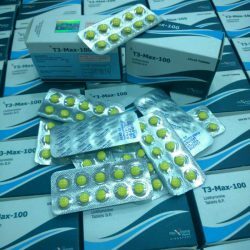 T3 is available at cheap rates cause we sell lots of steroids and work with manufacturers directly. All our steroids can be checked on producer’s websites for authenticity. Lots of bodybuilders buy steroids from us and we are reputable anabolic pharmacy with hunders steroids products available for sale. You can purchase T3 at rates cheaper than the market prices. The website is completely best place to buy Liothyronine Sodium online. You can injectable and oral form of Liothyronine Sodium at best possible prices here and if you find any place cheaper let us know – we will force our manufacturers to discount us the prices cause we are a very big player when it comes to Liothyronine Sodium products on the market. The best quality of this product is exclusively available on our store only. We only sell FDA approved medicines on our online medical store. We offer steroids for sale under all their brand names. You can purchase pills, vials or ampoules with overnight worldwide shipping free as well. The rates are cheaper than the market costs and the quality is even better. There are many websites which sell Liothyronine Sodium online. Overnight shipping is a special feature of our steroid shop. Liothyronine Sodium for sale online with fast international delivery to UK, USA and all other countries with credit card payments. 50% our clients come and buy T3 from us again within 1 month after delivery date: what can serve better feedback?! Fast overnight delivery is possible if you need to stack Liothyronine Sodium within few days.